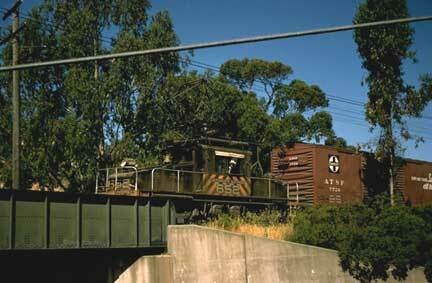 This is a color photo of SN 652 passing over Mountain Blvd. in the Montclair District of Oakland, shortly before abandonment (1956). It was posted on the Yahoo! SN group site and has been pasted here. The ironwork is gone, but the concrete abutments can still be seen on either side of Mountain Boulevard just north of the shopping district.